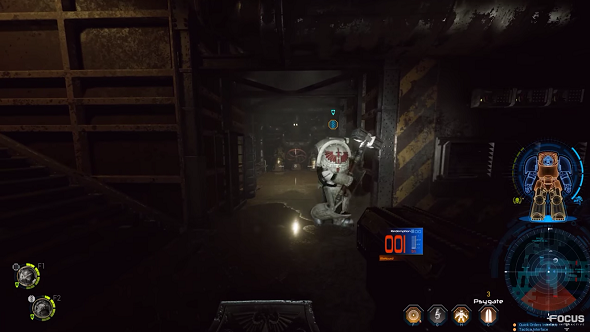 Around 14 minutes of pure Space Hulk: Deathwing gameplay just released, showing the Warhammer 40K warriors lumbering around the cramped confines of some station in hulking armour suits, laying waste to attacking genestealers. It all looks very Alien 2. For more games on the horizon, check our upcoming PC games list. In the gameplay trailer embedded above,Brother Barachiel must be escorted to the Saviour Array Interface Chamber during the game’s single-player campaign, cutting through enemies he advances with his squad. The pace looks much more methodical than most first-person shooters, with a minimap showing enemy presence as red blips, giving you an idea what side an incoming attack will come from. It looks like it’s more about keeping sustained fire on hordes of enemies than hyperactive twitch skills. Choosing the right psychcic powers and squad loadouts will be key to victory in this tactical FPS, with squad balance needing to be taken into consideration for each mission. You’ll want someone with a massive warhammer, obviously, but you’ll need to be able to fight at a distance too. Space Hulk: Deathwing releases on December 9, and you can get 15% off if you pre-order on Steam now.